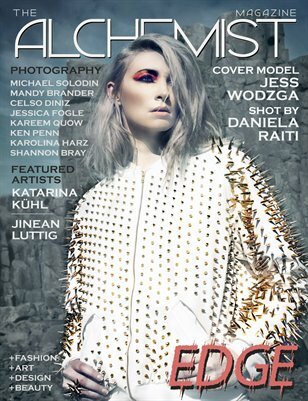 The EDGE Issue (2016) of The Alchemist Magazine features model Jess Wodzga on the cover photographed by Daniela Raiti. The issue also features photography editorials by: Celso Diniz, Jessica Fogle, Michael Solodin, Ken Penn, Kareem Quow, Karolina Harz, Mandy Brander and Shannon Bray. Featured Artists: Katarina Kühl and Jinean Luttig.